Navigate a Speeding Spacecraft through Tumbling Debris! Blast a gleaming rocket through descending rocks and crashing rubble! Asteroids is the ultimate celestial obstacle course for unnerving space travel! Annihilate Menacing Warheads and Save Civilization! Defend the famous cities from nuclear warheads raining down from the sky! Missile Command is the supreme test of pin-point precision, accurate aim and rapid response! 11-12-2018 aliensstudios Box Text Asteroids Navigate a Speeding Spacecraft through Tumbling Debris! Blast a gleaming rocket through descending rocks and crashing rubble! Asteroids is the ultimate celestial obstacle course for unnerving space travel! Missile Command Annihilate Menacing Warheads and Save Civilization! Defend the famous cities from nuclear warheads raining down from the sky! Missile Command is the supreme test of pin-point precision, accurate aim and rapid response! 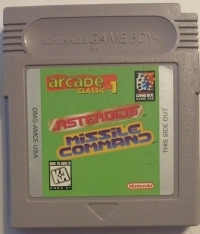 This is a list of VGCollect users who have Arcade Classics No.1: Asteroids/Missile Command in their Collection. 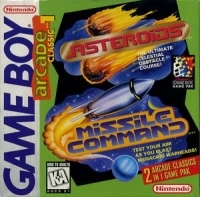 This is a list of VGCollect users who have Arcade Classics No.1: Asteroids/Missile Command in their Sell List. 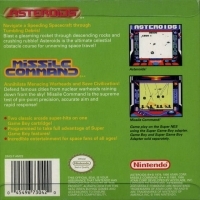 This is a list of VGCollect users who have Arcade Classics No.1: Asteroids/Missile Command in their Wish List.